As I approach one year of creating and maintaining content for this blog, I want to look back on the writings I have posted. This provides me an opportunity for reflection and also gives people unfamiliar with the bulk of the writing an overview of what it is about, broad as it is. Where does all this stuff come from? I am asked that more than anything else. The short answer is that I don’t really know. I have been writing my ideas, observations, stories, treatments, notes on books, poetry, recipes and a dozen other things in notebooks since I my early teens. The best I can do is to point to the fact that I push myself to read as widely as possible and I try to stay curious about things I encounter in the world. I have filled dozens of notebooks over the past forty plus years. It is unlikely these notes will offer much to posterity as they are inscribed in the most illegible handwriting you are ever likely to encounter. I had a professor in college who joked that my handwriting was not so much illegible as offensively ugly. He maintained that, with effort, he could read my handwriting, but it hurt his brain to do so. The intent of the wanderings site is to reflect my interests and reading, self publish some of my fiction and writing, and offer a window into how I see the world. There are more than half a dozen different types of writing, not equally distributed across the site. I have posted over 55,000 words in the year since I started this. The chart below shows the distribution of the types of writing by word count. This is most boring graphic in this article. I promise. The rest of the analysis uses something that has become popular in recent years as a way to give people a quick snapshot of the magnitude of items in a list, word clouds. (*If you are already familiar with word clouds and how they are constructed, feel free to just skip this text and scroll to view the various graphics. *) The word cloud is a data charting method that provides a pictorial representation of a set of words ranked by the values each is associated with. In the case of the word clouds presented here, each word is associated with the number of times it appears in the bulk of text included in each word cloud computation. Higher ranking words are rendered in larger fonts and different colors. The more text one has, the more useful the results and the more general the insights that one can glean. If you have read any popular print and web media in the past few years, you have surely encountered word clouds. In the case of the Wanderings site, I isolated the eight categories that all appear in the pie chart. The smallest in terms of word count are the Places and Poetry categories. Beginning with the Places word cloud, the size and color of the words suggest that places in space and time are discussed most in the text, The next few sizes of text down, the tan to lite green, show words like sensory, mindful, water, surroundings, quiet, and neighborhood. And this gives one a good idea of the major subtopics. The smaller the words, the less often they appear (and in the case of this word cloud, the more toward the blue end of spectrum) in the Places articles. Word clouds are easy to interpret and make it possible get a flavor for what the writing is about with a quick perusal of the (sometimes) pleasing hierarchy of size and colors. However, when there are too few words over all, the resulting cloud can be misleading (and occasionally funny). This is the case with the Poetry word cloud. From looking at this you might think I am obsessed with smells. The issue is that this word cloud data set has only a little over 2000 words of poetry, about 25 poems, and one of those poems uses the word “smells” almost 20 times. This skews the results quite a bit. Be that as it may, I can still see the many other words that show up more than once in the poetry; time, space, leaves, wind, and summer suggest that I’ve focused a lot of my poetry on nature. That is true, but there are also lots of other topics that I describe and compare to nature. It is possible to get a bit of flavor for the poems and hopefully this sparks your interest in reading from that section of Wanderings. The word cloud for the Reading section has predictable words like reading and books, but also a lot of other words that provide clues to the authors and types of books I tended to write about this first year. It is still not that many source words (just under 8000) to work with. They do tend to have a religious bent since I wrote separately about three authors for whom christian religious practice was a key part of their lives. The food and drinks section is dominated by my discussion of how I learned to bake bread and is tempered with recipe components. It is pretty clear what the section is about and readers can see, if they look carefully enough, the focus of the cooking articles. There are a few spiritual stories that are categorized as Wonderings. These are designed to loosely mirror the style of Kahlil Gibran, one of my favorite authors. Most are parables with messages about how I see the world, divine judgement, and those with whom we share our lives. Something I am disappointed in is the word man showing up more often than the word woman. I tried to be balanced since I believe it is important to have as many female role models, heroes, and main characters as male. Then again, this represents a little over 9000 words, so things can even out over time. It is something for me to keep an eye on and consciously make an effort to model. The next largest section with a little over 10,000 words is where I showcase people, individuals or groups, that I admire and who changed my life and/or the lives of others. Girl and girls show up a lot because of the article on the Girl Powered Robotics competition. I thought it was strange at first, till I remembered the article, which is one of the longest on the site. The next section is the series of small blogs where I present short reviews of books I’ve read recently that I find instructive or that in some way really captured my imagination and heart. I publish my thoughts on somewhere between 1/3 and 1/2 of the books I read. I write about 200 words for each blurb and try to quickly highlight what aspects in each book grabbed my attention and held it. I found this word cloud to be the least informative, but maybe it will spark interest for some readers. The wonderings section is the largest on my site by far. With almost 23,000 words of content and a broad range of topics, the word cloud is a bit more balanced and reflective of the writing. The wonderings category has topics that reflect my attempts to understand the world and to learn from experience. The stories also fall under this linked category. If I am asking questions about life, the world, reality, or the workings of anything from probability to gardening, then the article garners the wonderings category label. 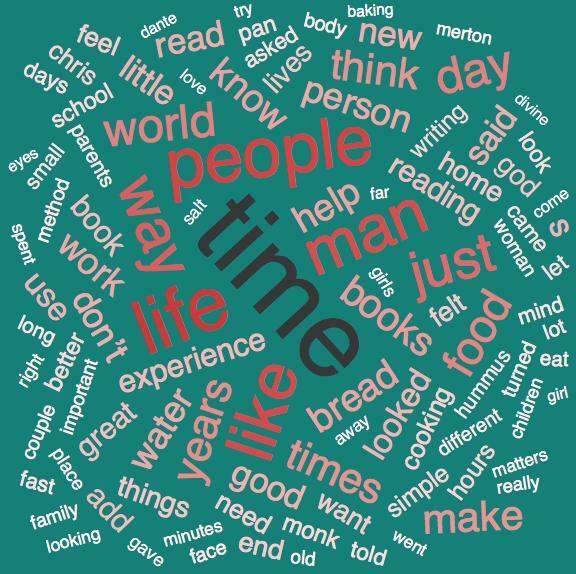 When I pull together all the blog articles (not including the poetry and the book summaries) I have almost 40,000 words and the word cloud contains a good mix of topically relevant words. All in all it showcases the diversity of the writing subjects as well as focuses on the recurrent themes. Finally, I submitted all 55,000 plus words from the mjmwanderings.com site to the word cloud generator and was rewarded with a comprehensive overview of the topics I have covered and the areas that I emphasize. What I really like about this display is that it really provides a good snap shot of the topics readers encounter on my site. I thought I would get the chance to write 50 articles over the course of the year, but I will have only reached about 42 by the time October rolls around. This is because I expanded the book summary area from the original 10% of books that I read to about 40%. I also added a poetry section in April. Also, it is rewarding and compelling to provide original and unique images for every main blog entry and poem. All these extras take time. So, on balance I’m happy with the amount of quality content I’ve been able to generate despite other time consuming writing projects, reading, and family duties. I hope this provides a nice overview of the site content and encourages readers to come back to the site and share with others the content that they enjoy.